Experienced concert pianist, teacher, and music director available for eager students of all experience levels and ages! Classical piano is my greatest passion. I enjoy teaching in all levels, and my work experience has included working with special needs children and teaching adults while an Adjunct Faculty member at New York University’s Steinhardt School. All students have the opportunity to perform in two annual studio recitals for free. Lessons are catered to maximizing the students interests, passions, and strengths. Simply put, my goal is to help each student become the best musician they can be. Erik most recently served as the Music Director for the National Tour of Kander and Ebb's timeless musical Cabaret. This production was on tour from December 2017 through May 2018 all across North America. Broadway.com's review praised the musicianship of the show, "Musical director Erik Flaten's musicians are impressive in their dexterity: At one moment, they are providing rich interpretations of the memorable John Kander score, while perhaps at the next they are playing denizens of the Kit Kat Klub or neighborhood thugs, wastrels and other folks of questionable repute. Flaten and his band are given their own richly deserved moments in the spotlight at the top of Act Two and the music director himself is given the well-earned final bow at the end of the curtain call." Rehearse, play piano, and conduct for the National Tour of the Broadway show, Cabaret. Working with Grammy and Tony award winning pianist Rob Fisher. 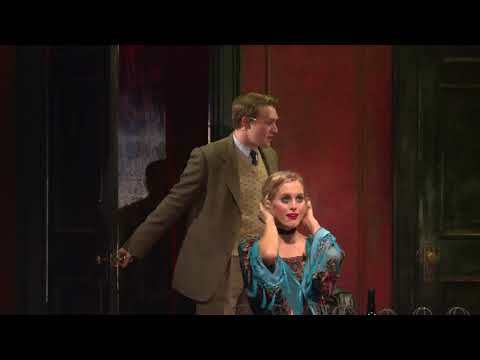 Promotional Video for the National Tour of Cabaret, which Erik Flaten was the music director. I was impressed by Erik's resume and had my first lesson today. He is very thorough and I can see from only one lesson that he will make a positive impact on my learning. Erik is able to explain in a way that easily understood. I don't normally write reviews, but felt compelled to after taking piano lessons with Eric for a few months. I'm an adult-learner, and was previously considering giving up piano due to a lack of progress. Eric's focused teaching style and enthusiasm for the instrument has re-ignited my interest in piano, while I can see (hear) tangible improvement in my playing with each lesson. I'd have no hesitation whatsoever in recommending Eric to students of all levels. I have written a review before but now after many months, feel compelled to write again. Erik is wonderful. He is so patient, talented, and dependable. My son who was not overly eager to continue piano looks forward to his lessons with Erik and has improved a lot. Recommend without any hesitation at all. Erik is wonderful! My 8 year old son has taken several lessons with Erik. Erik is great with him - patient, encouraging and you can tell he has planned the lesson realizing the importance of building on what was learned last. We are happy to have found such a great teacher and would highly recommend him for children or adults.